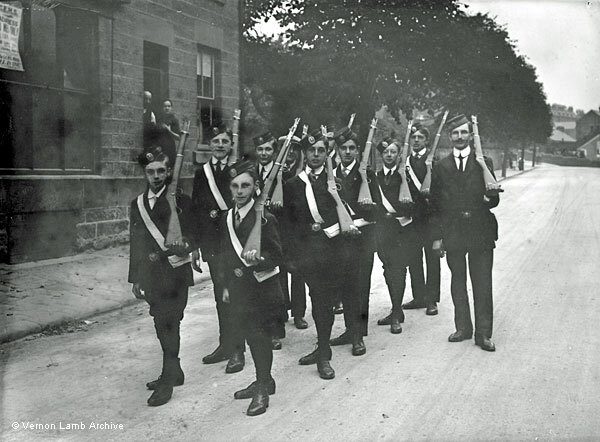 Description/Historical Information: Matlock Church Lads' Brigade, founded 1914 by Rev. J. B. Hyde, marching down the road. Staff Sergeant Frank Archibald Durrant is at the back. The building on the left was the Church of England Benefit Society, probably their HQ [also see VLA4991, VLA4992 and VLA5223]. There is a car showroom on the site today. Behind the group is the junction with Rutland Street, where M Wright & Sons was on the corner. Some of the bounday wall on the corner still remains today. The roof line of Matlock House Hydro / Rutland Court is visible above the buildings that then existed on the corner.